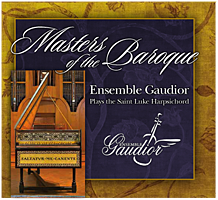 Ensemble Gaudior is dedicated to performing masterpieces of chamber music from the Baroque and Classical eras, using instruments from those periods or careful modern copies. By presenting this repertoire to modern concert audiences, we hope to contribute to the process of moving our world toward greater harmony. (The name Gaudior is borrowed from the musical unicorn in Madeleine L'Engle's book A Swiftly Tilting Planet, who time-travels through the universe joyfully harmonizing with the music of the stars and planets.) Founded in 2000 and based in the Washington D.C. area, the group is built around a core instrumentation of violin and basso continuo, but frequently collaborates with guest artists in order to allow a greater variety of repertoire. In addition, St. George’s Episcopal Church in Arlington, where we ourselves have performed, hosts a varied series of early music concerts, some of which are presented by Capitol Early Music and feature groups from out of town (see https://saintgeorgesmusic.org/concerts/ and https://capitolearlymusic.org/). Music and Gestalt coaching, my new direction! I have recently completed a full course of training, and am now certified as an ACC level Coach through the International Coaching Federation, and also as a Gestalt Pastoral Care Minister. Therefore, even though we know each other primarily through music, I would like to share my new creative dimension with you and invite you to join me in this process of exploration and discovery. To learn more, please visit my other website, Gestaltleadershipcoach.com. "Ensemble Gaudior also has a nice sense of energy, and I enjoy their nuanced performances of these works….a spirited and enthusiastic performance." " Vigor and effusion…. MacCracken used her gorgeous violin to solid effect, helping bring color and shape to each score." My chief end in presenting these concerts can be summed up in J.S. Bach's motto "Soli Deo Gloria": to celebrate, glorify, and enjoy God forever, who included music among all the gifts of creation. Read more about the Artists and Alexandra MacCracken, Director.